The team at the Lakeland Motor Museum will enjoy national exposure on television tomorrow night (October 12), after taking part in filming for the latest episode of Channel 5’s ‘Walking Britain’s Lost Railways’. Presented by engineer Rob Bell, the programme explores old railway lines that existed across the country before cuts were made in the 1960’s, all whilst experiencing magnificent rural landscapes and lost infrastructure. While the creation of the lines demonstrated how British engineering played a key role in people’s lives, every episode also explores how - once gone - the lost lines affected the community, industry and lifestyle of the area it disappeared from. Friday night’s episode features the now disused Cockermouth, Keswick and Penrith railway line, which, following its use as a mineral line, went into decline following the end of the First World War – and over the following decades due to competition from road transportation methods. In addition to delving into the history of the line, the programme will also feature the types of cars which were seen being driven in the Lake District at that time, which were considered as competition to the railways. The Lakeland Motor Museum’s 1925 Humber was used for the filming, expertly driven by the vehicle’s previous owner and long-term museum supporter, Ken Atkinson – who also restored the car himself. Ken and Rob were accompanied by the heritage attraction’s Operations Manager Chris Lowe – who last year celebrated his 25th year working for the museum. Episode 4 of the series airs at 9pm on Channel 5, Friday October 12 or catch-up on My5, Channel 5's catch-up service here. 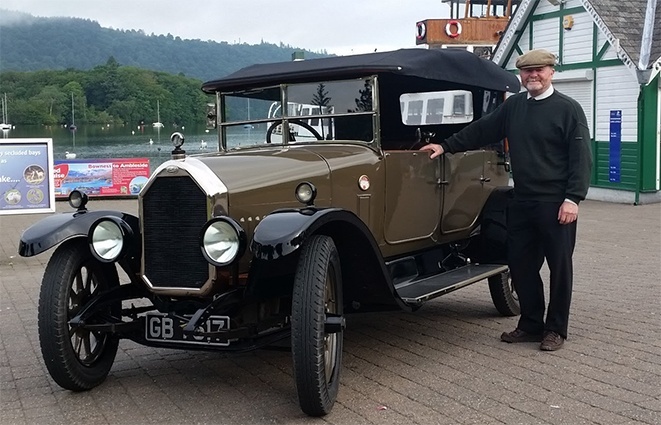 Lakeland Motor Museum Director, Bill Bewley on set with the 1925 Humber in 2016 - the car was also used for a movie celebrating Beatrix Potter's 150th year anniversary.